designed route. To ride the trolley all day long there is a small fee of $2 per day that provides unlimited access to the Red, Blue, Purple, Yellow and Green trolley routes. The $2 all day pass is sold at City Welcome centers, Gatlinburg City Hall and the Mass Transit Center. Don’t miss out on this money saving opportunity during your visit to the Heart of the Great Smoky Mountains! All of the Gatlinburg Trolleys are handicap accessible. In 1980, the Gatlinburg Trolley System began with only six trolleys, but has grown to more than twenty trolleys traveling 50 miles of trolley routes! Gatlinburg’s Trolley System is now the fifth largest mass transit system in the state of Tennessee. The Gatlinburg Trolley is an easy and fun way to get around town without all the hassel of traffic and finding a parking spot. It’s environmentally friendly too! The Red route travels from River Road to the Convention Center, the Blue route travels from East Parkway to the Community Center, the Purple route travels from North Gatlinburg Parkway to the Welcome Center on the Spur, the Yellow route runs to the Arts and Crafts community, and the Green route runs from the Historic Nature Trail to the Convention Center. For a satellite map of the trolley routes visit, gatlinburg.otvia.com. Fireflies, also called lightning bugs, are actually beetles! They take from one to two years to mature from larvae to adult and live as adults for only about 21 days. The light is produced by chemicals and enzymes in their abdomens and is called “bio-luminescence”. There are at least 19 different species of fireflies in the Park, but only one provides a stunning light show every year in mid-June for about 2 weeks. The Synchronous Firefly (Photinus carolinus) is the only species in North America whose individuals have the ability to flash in unison. The only other place in the world you can see this unique display is Southeast Asia. Fireflies emit light to attract a mate. In most species of firefly, both males and females are capable of flashing. 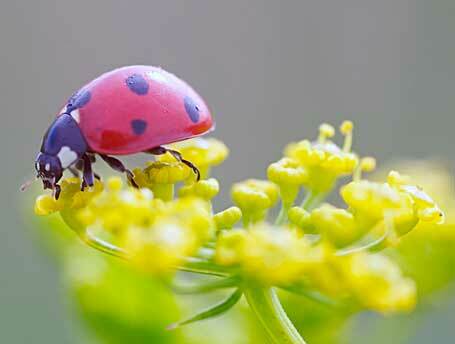 Each species has its own “flash-code” to help males find females of the their same species with which to mate. The males fly and flash while the usually stationary females respond with a flash. Most species produce a greenish-yellow light, but one species produces a bluish light. How and why these fireflies are able to flash synchronously is a more complicated question. Several researchers have studied these beetles in search of an answer. UConn researcher Andrew Moiseff has been trying to Unravel the Mystery of the Fireflies’ Flash for years. No one knows for sure why they flash together, but it is likely related to competition among males. There are lots of places to view the light show in and around Great Smoky Mountains National Park. According to Discover Life in America, these fireflies are found in every watershed in the park. The best places to view them are at the edges of moist wooded areas. The display starts at full dark, usually around 9:30 and lasts until about midnight. One of the best places to see light show is at Elkmont Campground. From late May to early June, the road to Elkmont will be closed after 5 p.m., but you can park at Sugarlands Visitor Center and take a Trolley to Elkmont for $1 roundtrip. Contact the Park for more information: 1-865-436-1200. Please use your flashlight as little as possible and cover it with blue or red cellophane -this light is not as bright and won’t disrupt the show for others. Do not catch the fireflies; just like all other wildlife in the park, they are protected! Take your trash with you out of the Park. Hope you are able to visit us in the Smokies this June and experience this natural wonder firsthand! Remember, this event is a sell out each year, so be sure to book your Gatlinburg cabin with ERA in the Smokies! Synchronous Fireflies 2012 ~ A truly amazing event!! Fireflies, also called lightning bugs, are actually beetles! The light is produced by chemicals and enzymes in their abdomens and is called “bio-luminescence”. There are 14 different species of fireflies in the Park, but only one provides a stunning light show every year in mid-June for about 2 weeks. The Synchronous Firefly (Photinus carolinus) is the only species in North America whose individuals have the ability to flash in unison. The only other place in the world you can see this unique display is Southeast Asia. Fireflies emit light to attract a mate. In most species of firefly, both males and females are capable of flashing. Each species has its own “flash-code” to help males find females of the their same species with which to mate. How and why these fireflies are able to flash synchronously is a more complicated question. Several researchers have studied these beetles in search of an answer. UConn researcher Andrew Moiseff has been trying to Unravel the Mystery of the Fireflies’ Flash for years. No one knows for sure why they flash together, but it is likely related to competition among males. One of the best places to see light show is at Elkmont Campground. From June 4-12, the road to Elkmont will be closed from 5 pm until midnight, but you can park at Sugarlands Visitor Center and take a Trolley to Elkmont for $1 round trip. Contact the Park for more information: 1-865-436-1200. Join us in Gatlinburg as we celebrate the beauty of spring at the 62nd annual Wildflower Pilgrimage! The 62nd Smoky Mountain Wildflower Pilgrimage is a 4 day event offering 134 professionally guided walks and indoor presentations which explore the region’s rich wildflowers, fauna, ecology, cultural and natural history. Most programs are conducted on the trails in Great Smoky Mountains National Park, while indoor offerings are held in Mills Conference Center and Sugarlands Training Room in Gatlinburg, Tennessee. All programs will be held rain or shine. 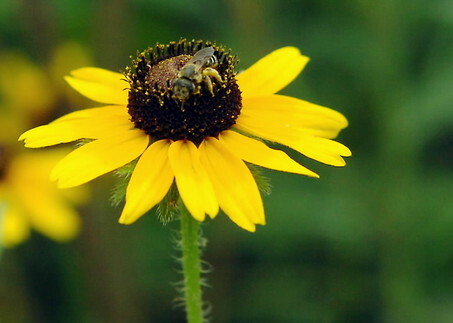 The 2012 Smoky Mountain Wildflower Pilgrimage will be held from April 25th through April 28, 2012. Online registration just started! Plan your trip to Gatlinburg now! Wednesday through Saturday, there are all sorts of walks and hikes scheduled, with something for everyone! Take a short easy walk on the Cove Hardwood Nature Trail, a wildflower hotspot (program #3). If you are up for something more rigorous, sign up for the Road Prong Trail Wildflower Hike (program #23), a 5-mile moderate to strenuous trek starting at Newfound Gap. Be prepared and download a printable Wildflower Checklist. If you would like to learn about something other than wildflowers, there are plenty of opportunities for that too! Take a Fern Walk (programs 4, 58, 70, 123), a Bugs and Butterflies Walk (program #s 41, 75, 78), or a Black Bear and Wild Hog Walk (programs: 32, 66, 106). Interested in history? Maybe you should sign up for Cultural History Walk (program #s18, 36, 45, 69, 79, 95, 116). 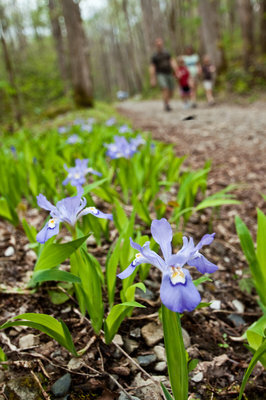 Download a 2012 Wildflower Pilgrimage brochure to see the full schedule of hikes and workshops offered. Photographers are invited to enter the 2012 photography competition. Entry categories include: 1. Flora 2. Fauna 3. Landscape 4. Youth Produced. Winners for each category will be determined by the votes of registered pilgrims. Please have your program choices and alternative selections, as well as your credit card information, in hand when you register on-site. A handy “Program Planner” is available on page to record your program choices. All events are covered by the following registration fees, except for Wednesday’s luncheon event, program number 9. This event costs $25.00 and registration is not required to attend. Payment may be made with Visa, MasterCard, American Express, or Discover credit cards (cash or check at on-site registration only). Refunds are NOT provided and your fees will be used as a contribution to help support this event. An Early Spring ~ The Smokies are blooming early! Folks who go looking for the Smokies’ annual spring color show at the normal times this year may think the wildflowers are pulling a little late April Fools’ prank on them. While the spectacular display of blooms are usually at their peak in the latter weeks of April, this year spring blooming started in some areas as early as January and is likely to be waining by the time the annual Spring Wildflower Pilgrimage treks out April 25-28. With temperatures well above normal and relatively little snow, one can hardly blame the plants for being confused about what season it is.